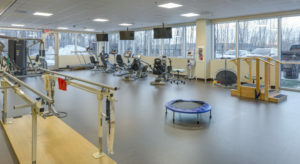 In September 2014, US Federal Properties (USFP) completed a new Department of Veterans Affairs (VA) Outpatient Clinic in Wyoming (Grand Rapids), Mich. 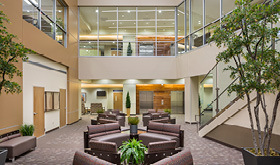 Located off Highway 6, in the growing southwest suburb of Grand Rapids, the 126,000 square-foot LEED Silver Certified building is a leading outpatient clinic in the region. The project was awarded to USFP in May 2012 based upon quality, price and a clear understanding of the client’s needs. The facility was designed to provide a warm, de-institutionalized atmosphere that welcomes patients into an uplifting healing environment. The sustainably designed and energy-efficient building features drip irrigation, low-flow water fixtures, green power and the planting of native grasses and protective tree stands. By complementing an adjacent hospital, the clinic plays a significant role in a larger medical campus, thus increasing its impact and presence in the community. Since the project’s completion, USFP has and will continue to provide property management, engineering and construction management services throughout the lease term.